Kohler Generator vs Generac Generator – With the consequences of Hurricane Irma and other catastrophes, many families are evaluating their disaster-preparedness plans. One of the main things to plan for is your power supply… Kohler Generator vs Generac Generator! A generator will help you in the event of a hurricane, tornado, power outage, and other long- and short term situations. Generators are invaluable for countless other reasons as well. As blackouts are continually on the rise, in the United States especially, owning a generator is a smart idea. In this post, we’ll tell you everything you need to know about the difference between Generac and Kohler generators. You’ll learn what is important to consider for your situation and be able to make the choice between these two popular models for yourself. First, you need to decide if you want a standby generator or a portable generator. There are several options as both brands offer both models: Generac standby generator, Kohler standby generator, and Generac portable generator or Kohler portable generator. Generac constructs their own, custom OHVI engines for their generators. Because of this customized engine, Generac generators last for a long time, making them a wise investment for those who plan to use their generators for years, even in commercial applications. Additionally, these generators can create up to 2 MW of power. Their pressurized lubrication means that they’ll last for a lot longer than other engines, without needing as many repairs/replacement parts. In terms of the enclosure, Generac generators have either steel or aluminum options. As you’re likely aware, these materials are inflammable. This makes them a wise choice if you need to put them closer to a noncombustible surface. However, if you live near salt water, make sure you select the aluminum enclosure option — a steel one will rust. When it comes to buying a generator, many shoppers are impressed by the wide variety of options Generac offers. You can even select the color of generator you want. Generac offers ranges of 6 kilowatts to 50 kilowatts, so it’s easy to find the amount of power you’ll need to keep your home or office running in any circumstances. You can also find options that are specific to the environment that you live in, and well within your budget. When it comes to customer satisfaction, there’s much to love about Generac generators. If you don’t want the loud rumble of a generator, then you should certainly consider Generac. This is because their generators are designed to be much quieter than other options on the market. They can even run a self-test that’s as close to silent as possible. Additionally, these generators are made with what Generac refers to as “G-Flex” technology. This means the engine self-adjusts according to the amount of energy you need. Since they’re not running on high all the time, they’ll be much quieter. Plus, they’ll save you fuel. If you’re interested in off-the-grid living, chances are you have a lot of love and respect for our earth. You likely want your environmental impact to be as low as possible, even when it comes to the type of generator you purchase. This is another reason why so many people love Generac’s products. First, the brand has made a commitment to continually testing and developing technology that will allow for generator users to reduce their footprint. Additionally, there are lots of fuel options that lessen your impact on the land around you. One of the most popular is called Bi-Fuel. This is a combination of natural gas and diesel fuel. Its goal is to make your generator run for longer, while also lowering its amount of carbon emissions. So, if going green is important to you, Generac generators are a great option. A competitor to Generac is Kohler generators. Kohler generators are another wonderful option when it comes to your power supply. They’re one of the biggest names in the industry for a reason. When it comes to engine life, the two brands both have options that are designed to last for as long as possible. In fact, Kohler offers a 2,000 hour, or five-year, warranty on all of their standalone models. However, what’s especially interesting about Kohler’s generators is that they are commercial-grade. Kohler Generators automatically sense and switch on in the event of a power loss. This means that, in the event of an outage, it will only be a few seconds before power is restored. 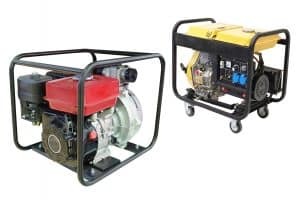 Unlike with a portable generator, this means you won’t have to brave going out into a dangerous storm just to switch on your generator. If you’re concerned about safety, this is a huge plus. Kohler generators know to automatically switch on because their standby generator models are installed permanently next to your home, and are always monitoring your power supply. Additionally, Kohler engines are a bit sturdier than Generac engines. Therefore, if you live in a harsh environment, this is likely the option to go with. When it comes to enclosures, Kohler has more options than Generac does. You can choose between plastic, aluminum, and steel enclosures. Unless otherwise specified, Kohler’s standard enclosure material is the plastic option. However, the plastic option is immune to corrosion. So, if you live in a place with plenty of salt in the air, this will likely be the better choice for you. Sometimes, no matter how good an offer from a new company sounds, you just feel more comfortable going with the brand that has a proven track record. The same can certainly be said of generators. Kohler has the resources to conduct serious quality testing, throughout both the design and the manufacturing process. Plus, they’ve been in business for nearly 100 years. This means that their products have withstood the test of time. Additionally, it means that it’s much easier to get instant support when you need it. If you’re having problems with your generator, you can easily get in touch with a representative of Kohler, to quickly get the problem solved. Finally, the company’s size and influence mean that it has lots of local representatives in many different areas. This means you can meet with a specialist in person, should you ever want to. This kind of advice can be invaluable. Generac or Kohler: Which Will You Choose? If you have decided against a portable generator and want a standby generator, you will be happy with either the Generac or Kohler models. Though perhaps the biggest difference between these two brands are the enclosure options, you need to consider price and availability. There are many excellent generators on the market to consider. We’ve reviewed and compared several other top generator brands available. Of course, whether you’re into prepping, living off the grid, or just have a love for the great outdoors, a generator isn’t the only thing you need! Spend some time on our website to evaluate how prepared you are for an incoming disaster, learn more about prepping, and connect with others who are interested in rural living. You never know when you may need a backup power supply. As more and more people are living off the grid, consumer interest in generators is growing. Others may require a generator for a life-saving medical device or as a backup power source for their work and livelihood. You may want one to safeguard a freezer of food. No matter your reasons for buying a generator, what’s important is that you make the best decision for you and your lifestyle. In the meantime, go out and find the generator you can rely on to always keep the lights on.